When product discovery gets easier for users, large marketplace puts up its plate for multiple vendors and service suppliers, while costs lower for all players, the IT industry gets thumbs-up. It has seen to it that millions of businesses across a wide spectrum of industries use trade portals and collaboration platforms to grow, streamline processes, reach clients and create partnerships. Yet, who gets to take care of the IT industry? Two years ago Agiliway partnered with ROI4CIO project initiators, sharing their concern about the inefficient collaboration and sales processes in the IT sector. As new technologies constantly emerge and hi-tech business needs grow, the role of CIO in the company goes far beyond traditional IT management. Today, creating business value through technology means going over an expanding IT market in search of the most value-added products. Such decision-process shaping work is usually long, tedious and resource-intensive. It stands to reason why the list of skills an executive scrambles to fill varies from data management skills, expertise in compliance and security to corporate financial skills and legal expertise. At best, the IT solution is based on conflicting views coming from various IT market players: resellers, integrators, distributors, suppliers. Still, more often than not, the sights shift to the most “popular” IT product. Take the matters to the other side and the pitfalls slowing down the selling process are equally as common. First, IT vendors and suppliers engage in a whole array of activities such as vendor-customer relationships management, researching prospects, working on presentations to name a few. After successful completion, they spend most of their time preparing quotations, giving estimates, calculating fixed and variable costs only to face the need of further multiple recalculations later as the customers often second-guess their decisions and change requirements. 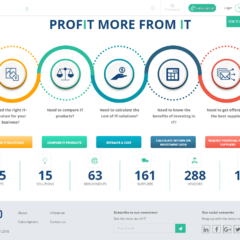 Upon release of TYPO3 collaboration platform for CIO, Agiliway completes ROI4CIO project and marks start of a new phase in the IT collaboration and sales processes where all the aforementioned stumbling blocks are no longer regarded as a necessary evil. Unlike any other B2B portal or marketplace, ROI4CIO platform goes far beyond automation of B2B sales. In the simplest terms, ROI4CIO is a powerful platform for choosing between multiple solution alternatives the most appropriate one based on business tasks. It places a premium on an optimized cooperation between IT vendors, suppliers and business entities by automating price and ROI calculation for a selected IT solution. requests commercial offers for IT solutions. form partnership with IT vendors and suppliers. That being the case, deals are now closed 50% faster, while time spent calculating specifications for customers is reduced to 90%. Automation of pricing and instant configuration of specifications are obviously value adds ROI4CIO brought to business entities seeking and offering an IT solution. Yet it didn’t happen in a wink nor did it come easy. Armed with a solid project strategy, Agiliway team had to utilize its prior experience in implementing Artificial Intelligence technologies, develop new competencies, change perspective a few times before it turned the following challenges into a unique solution. ease of support after deployment. It didn’t take long to see that the chosen path has led us to our destination. The service was up and running in compliance with requirements. Rewarding and far-reaching as this path was, our client had no plans to stop right then. During the production stage, it already became clear that the service requires more advanced logic to fit the needs of users. Since business tasks and methods of profitability calculation vary significantly among business entities, Agiliway team managed to develop a complex AI (Artificial Intelligence) algorithm that searches through the IT solutions space to find the optimal one specific for each client’s requirements, company characteristics. In this scenario, the logic why one solution is preferred over another is programmed by ROI4CIO AI search algorithm. As it happens IT managers, vendors and suppliers still keep it to old time-sapping ways and use Excel tables to calculate software costs or ROI. The decision was made to develop a feature for automatic price and ROI calculations, that is ROI calculator. It automatically calculates the profitability of investment into IT solution accounting for a host of parameters: operating costs, initial costs, time of forecasting, the risk of models and implementation, user’s requirements. IT vendors and suppliers will need to input only price lists, while ROI calculator will do the math. Despite its advanced features, the platform was designed with a user friendly customizable interface, which makes it a pleasure to work with. The process of decision making usually starts with data collection and goes through a few more equally crucial stages. When an IT manager is involved in the process, one of the stages is presenting a decision or proposal to senior executives who’ll weigh options and call to action. 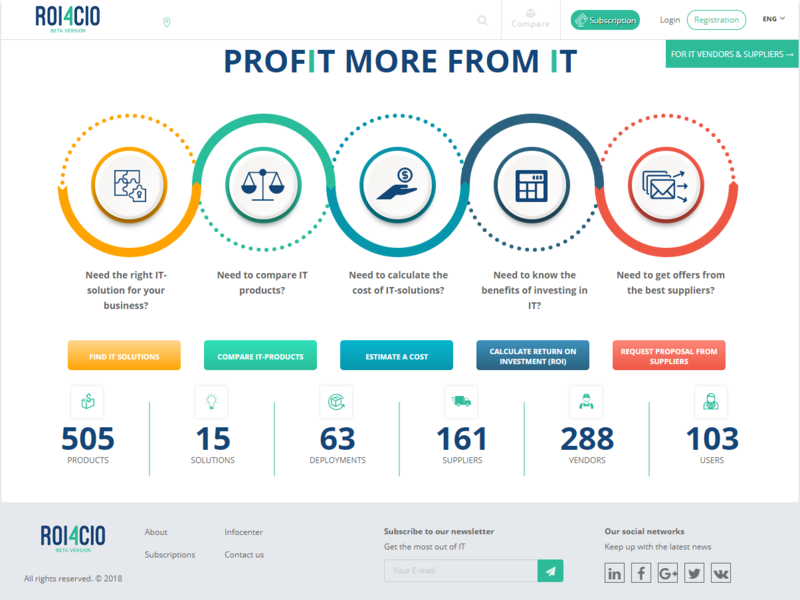 To make it less of a hassle for an IT manager ROI4CIO automatically and very conveniently imports into a PDF file data about suitable IT solutions with costs, returns, trade-offs, numbers of implementations calculated. What began as a catalog of IT solutions gradually turned into a platform with advanced configuration options and a service with an advanced logic. Business challenges the service solves and benefits it provides drew IT-vendors, suppliers, distributors, resellers. Given the size of the catalog, a variety of advanced features and modular design of the platform, performance problems started plaguing the service. We took an action and optimized TYPO3 platform in terms of speed and performance. The window load time now takes up to 2-3sec. Developing a collaboration platform where users share resources, transmit information between servers, communicate, cooperate and leaving a security issue unattended is a matter of utter negligence. That’s the reason why this issue was resolved in the first place with a complex control policy for accessing resources and activities. Dedicated work on ROI4CIO project, attention to every detail, close cooperation with potential customers and focus groups bore fruit. Our TYPO3 solution performs as expected. It has something rare to offer, namely an accurate analysis of IT solutions on numerous counts. 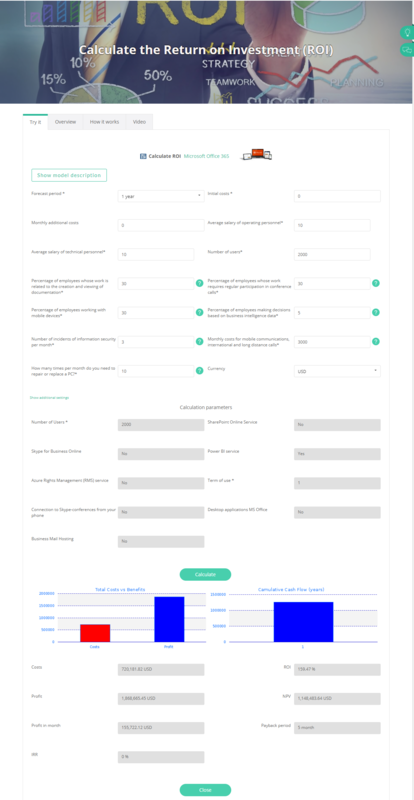 ROI4CIO neural network algorithm selects the best IT solution based on entered criteria, while ROI-calculator determines the financial benefits of the IT solution before its deployment. Add to the list an optimized system performance, complex access control policy, feedback on deployment results, few plugins for improved user experience and the desired outcome came on short notice.